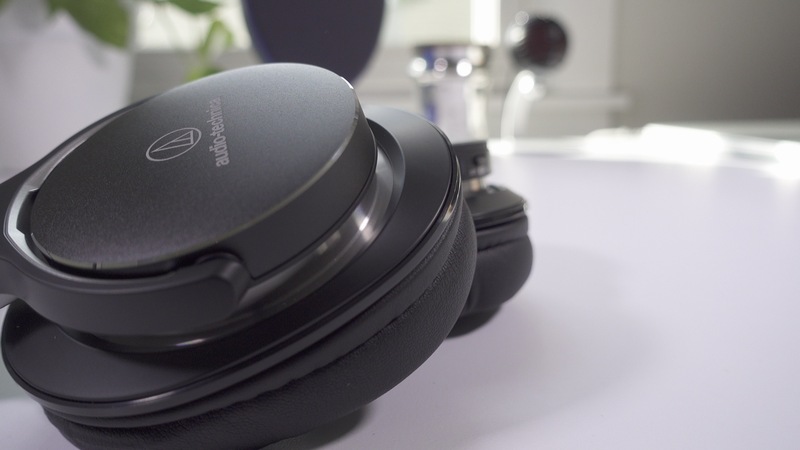 If you read our review of the ATH-M50x closed-back headphones, I made it pretty clear that I was a fan of what Audio-Technica was offering. The ATH-M50x’s are well-known for giving Beats By Dre headphones a run for their money, and at a much more affordable price. I also had the opportunity to go hands-on with one of Audio-Technica’s newest offerings, the ATH-MSR7NC. These noise-cancelling cans differ in many ways from the company’s mainstream offering, and at more than double the price of the M50x’s, venture into more premium territory. Should you consider them? Audio-Technica says that the MSR7NC headphones feature Hi-Res Audio technology. Unlike high-resolution video, “high-resolution” audio is a somewhat ambiguous label in the sound realm. To help clear things up, Audio-Technica says that, per Hi-Res Audio standards, headphones must have transducer frequency performance to at least 40 kHz in order to accurately don the label. These headphones, with its 5-40,000 Hz frequency response, meet the 40kHz threshold, and exceed the ATH-M50x by 12kHz on the high end. Unfortunately, there is no universally agreed upon standard, no audio consortium, if you will, that sets guidelines that all manufactures must follow. The Hi-Res Audio standard is established by Sony, as shown from this internal memo. Buzzwords aside, this is the first pair of so-called high-resolution headphones that I’ve tried. To test them out I played a high bitrate track by Hikaru Utada called Sakura Drops. If you’re a fan of heavy bass response, then you may come away a little underwhelmed by what you first hear from the MSR7NC. Bass response isn’t nearly as prominent as it is on the company’s most popular cans, and some music fans, who prefer booming bass, may not like that. I admit that I, too, was a bit underwhelmed on first listen. After several hours of listening I begun to really appreciate the sound quality emitting from the MSR7NC’s 45 mm drivers, which feature acoustic vents on the side housing. After repeated listens, it’s evident that they sound noticeably better than the M50x’s. Active noise cancellation aside, the nuanced sound provided by these cans is impressive. Indeed, these headphones tend to favor mid-range and highs more than they do the low end, but the low end is still there and present when called upon. It’s just that bass doesn’t dominate like it does on many popular pairs of headphones these days. The ATH-M50x features good build quality, but the MSR7NC features a more pristine fit and finish. The ear cup housing is made from a dense matte black plastic with silver accents around the perimeter of each can. Unlike the ATH-M50x, you don’t see any wires, as Audio-Technica does a great job of completely concealing them. Those are all small details in the grand scheme of things. What makes these headphones noticeably better build quality-wise are the ear cups, which are made with memory foam. I have a memory foam mattress on my bed, and I find it utterly abysmal, but I love having such foam on my headphones. These cans are super-comfortable as a result. 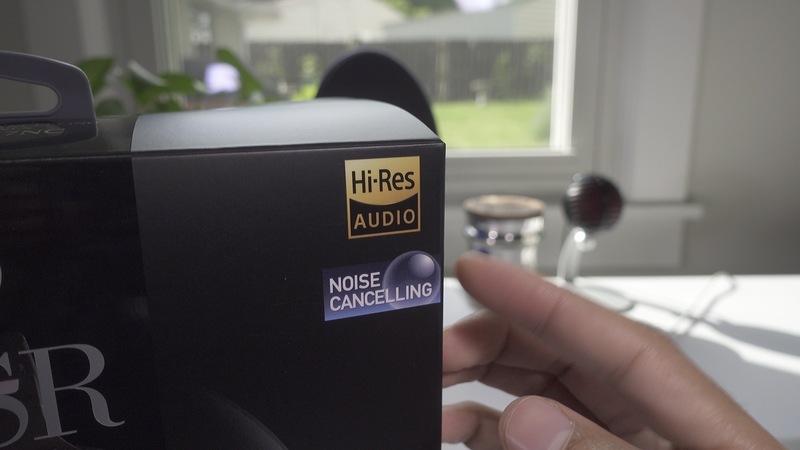 Don’t be disillusioned to think that noise cancellation means that you can no longer hear anything going on around you, as this simply isn’t true. Noise cancellation does suppress ambient noise, but it doesn’t completely get rid of it. That all said, I find that these headphones do a good job of dampening unwanted noise. 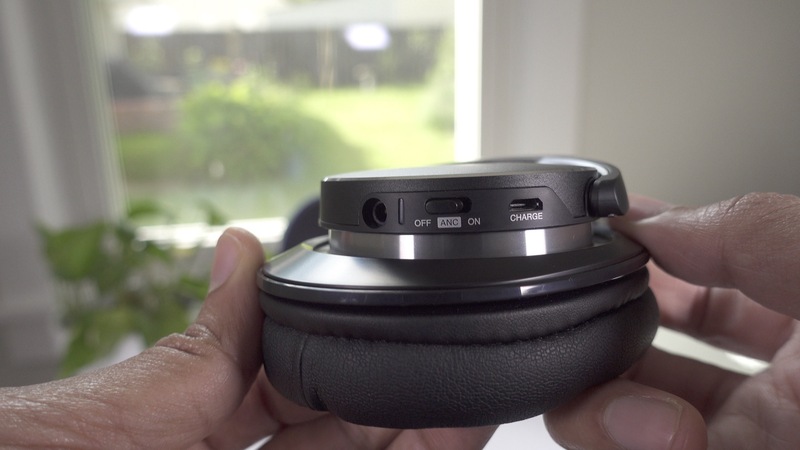 The active noise cancellation increases the clarity of these headphones. It won’t completely eliminate noise, but it’s effective enough to make it easy to forget about what’s happening around you. The noise cancelling microphones are located at the top of each ear cup, instead of on the side, which Audio-Technica says aides in the consistency of the noise cancellation. On the left ear cup, you’ll find the noise cancellation switch, which rests between the blue LED power indicator and the micro USB port for charging. Audio-Technica says that users can get up to 30 hours of active noise cancellation via a four hour charge. When you think of noise cancelling headphones, the first company that probably pops into your mind is Bose, with its QuietComfort line of headphones. I’ve tried the Bose QuietComfort 25’s a few times before, but don’t personally own a pair in order to compare the two. I do know that Bose doesn’t divulge specs for its headphones and drivers on its website, so it’s hard to compare specifications between the two. That said, the Bose QuietComfort’s are about the same price, and have been mostly well received among reviewers. For some users, one of the biggest downsides of the M50x was the lack of a remote control and microphone for smartphone interaction. The MSR7NC’s solve this problem by including two detachable cables in the box, one with and one without a remote control. Along with the two detachable 1.2m cables, you’ll find an airplane adapter for plugging into a plane’s entertainment kiosk, a micro USB charging cable for recharging the battery, and a leatherette carrying case. I wish that Audio-Technica would have splurged a bit on the carrying case. 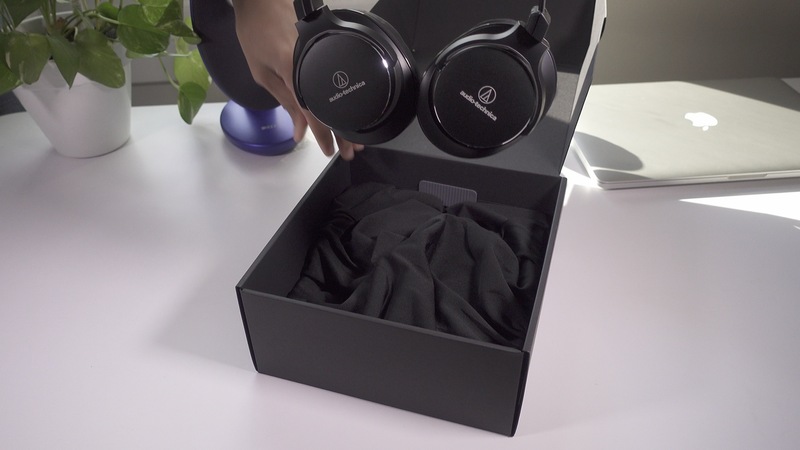 Given the fact that these headphones don’t collapse as compactly as others in the company’s lineup, the leatherette carrying case doesn’t seem to do this set justice. If you’re someone who can appreciate headphones that aren’t totally bass dominated, then chances are you will enjoy the ATH-MSR7NC. These headphones provide a much more balanced sound, and lend plenty of opportunity for all ranges — mids, lows and highs — to shine. That’s not to say that these cans are puny on the low end, they just don’t thump as much as the ATH-M50x’s do. Comfort is a big part of the equation when it comes to headphones, and these excel in that area. The memory foam is noticeably more comfortable than the ear cups on the M50x’s. If you’re looking for a pair of premium headphones with active noise cancellation, the MSR7NC’s are worth considering. 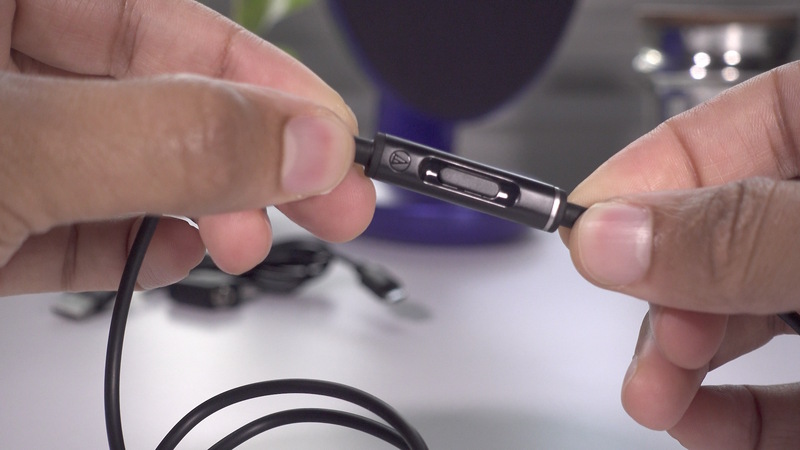 They are pricey when compared to the company’s most popular headphones, but the sound quality, comfort, and reduced ambient noise, goes a long way towards justifying the price. If price is a primary point of emphasis, then the ATH-M50x is a good choice if you’re okay with a slightly more bass dominated pair of headphones. Coming in all shapes and sizes, a good pair of headphones give you your own personal listening experience.